As a lonely pet goldfish imagines the world outside of her tiny fishbowl, she encounters another fish in a bowl on the other side of a wall of books that separates them. Communicating with each other through fantasy and colors, they begin to see just what their worlds might look like without the barriers. 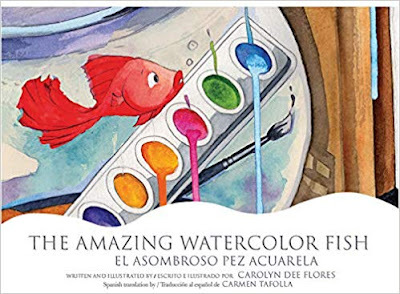 Each page—consisting of vibrant and expanding visual art and partnering poetic storytelling in English and Spanish—contains hints that, when youngsters perceive them, add to the significance of the tale. Flores’s art—on a palette that begins with velvety-textured pencil drawings of a sad goldfish and her limited fishbowl environment and, page by page, expands to include increasingly layered translucent watercolors that give them more saturation—reflects the many colors and textures of the outside world the goldfish imagines and fills in with her own brush and watercolor paints—a world she can’t see behind the wall of books. At the same time, another lonely pet fish on the other side uses his brush and palette to communicate with her across the seemingly insurmountable barrier of books which, towards the middle, are beginning to fall open. And towards the end, the books have toppled and the two fishes are swimming together in one bowl. Youngsters might recognize that the pencil drawings represent the drab realities of the fish and their separate environments, and, as the translucent colors are layered on, their worlds become bigger and more imaginative and joyous—and maybe, their lives are expanding as well. Younger listeners may not immediately be able to interpret some of the visual symbolism here—or they might after a few back-and-forth page turns: the table top might be a continent (far off are tiny images of the Egyptian pyramids and a sailing ship), the toppling books might be continental divides or national barriers or The Wall, the water gushing out of the open door might be the fishes’ expanding world—the one that they had imagined and is now real. Both Flores’ English and Tafolla’s Spanish rhyming poetry reflect their own and each other’s playfulness with the story, words and syntax, and together, present a rare cultural and linguistic collaboration. They have created two different and compatible ways of looking at the world; two kinds of poems that work beautifully and bounce off the art. Indeed, to read the English and Spanish versions alongside each other—the open, uncomplicated, rhyming English version and the “gran fantasía dramática” of the rhyming Spanish version—is a treat for hablantes, for English-speakers, and for bilingual readers alike. The Amazing Watercolor Fish / El asombroso pez acuarela is a gentle, powerful statement of acceptance, togetherness and friendship. Without hyperbole, without polemic—but with lots of symbolism—Flores’ and Tafolla’s loving and lovely story suggests the importance of jumping the walls in these challenging times. It’s highly, highly recommended.